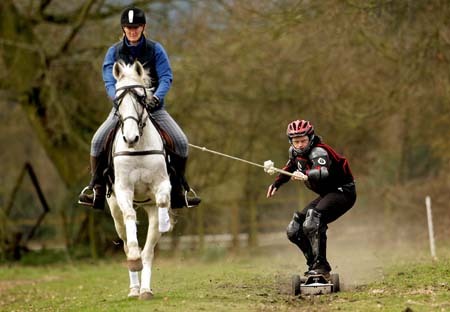 Thrillseekers are competing in Britain’s latest extreme sports craze of ‘horse boarding’ – where participants are towed behind a horse at 35mph on an off-road skateboard. Professional stuntman Daniel Fowler-Prime, 31, invented the sport three years ago after he strung a rope between his off-road ‘mountain board’ and a horse. Now he has developed the daredevil stunt into a fully fledged sport and is looking forward to hosting the UK’s first ever horse boarding championships this summer. Adrenaline junkies stand on a mountain board while gripping a rope and attempt to maintain their balance as the horse is spurred into a gallop by its rider. The rush of acceleration provides the greatest thrill, with riders reaching speeds of 35 miles per hour in just five horse strides. Daniel, who grew up in Bude, Cornwall, revealed today that he came up with the idea while messing around on a farm with friends. He said: ”This is a fast, adrenalin-fuelled equine team sport and it is growing rapidly. ”There’s a raw surge of natural power you wouldn’t get from any other sport, and the acceleration is explosive. ”A lot of skill is involved and the horse rider and boarder have to work together because if they don’t the boarder goes flying. ”We have people from all over the country coming to the training ground to try it. It’s very accessible for people of all abilities, you only need a bit of space and a lot of guts. Daniel works as a professional stunt horse rider and has appeared in films such as the Da Vinci Code, Kingdom of Heaven and Vanity Fair. He invented his new sport in 2006 after he visited a friend’s farm in Devon and they experimented with towing mountain boards behind cars and horses. Daniel, founder of the Extreme Horse Riding Association, has also experimented with horse surfing, where a horse rider drags a person on a surf board. However, the sport proved to be inaccessible, so he has now opened the National Horse Boarding Training Centre in Seisdon, near Wolverhampton. After interest in the sport grew rapidly he organised the National Horse Boarding Championships, which will be held over five events this summer. In the competition two teams of one horse, one horse rider and one board rider, will race over an 100m course. The board riders wear protective pressure suits and must communicate with the horse rider to control speed and acceleration. Daniel added: ”I have always been a skate boarder, and later a surfer, and working in the field with horses it was just a matter of time before I put the two together. ”For me it beats being dragged by a car because horses can be unpredictable and they get excited when they know they’ll get to run. 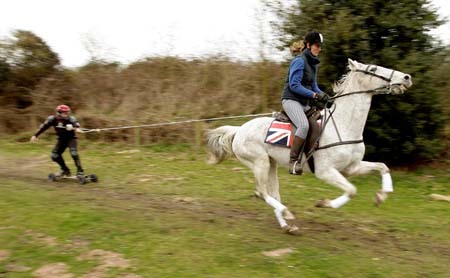 ”Horses generally take to it very easily and normally it only takes a couple of hours to get them used to it. ”It’s the first new equine sport for a long while and in our show we have added ramp jumps over four metre gaps. It takes horse riding to another level.